This Sunday’s scripture text has several very recognizable themes in it. One is the revelation of the name of God (“I am who I am”); another is the burning bush (a Sunday school lesson favorite); third is the concept of holy ground and God’s command for Moses to take off his sandals. While on Sunday, I plan to focus my sermon on the first theme, I definitely resonate with the third. I wear flip-flops as often as I can and when I’m sitting and reading or at my desk typing I slip them off. I love going barefoot if possible. However, I understand that there’s a time and a place for everything, and if a guest comes into my home or a visitor to my office, I immediately put my shoes on. I want to look respectable. 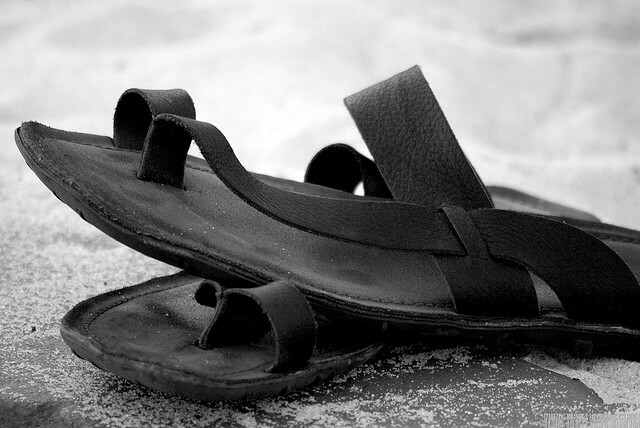 Funny how in the ancient culture in which Moses lived, just the opposite was true: sandals “off” was a sign of respect or reverence, among other things. Scripture tells us more about the meanings associated with sandals. Later in the book of Exodus, the Hebrews are instructed to prepare for their journey out of Egypt by eating the Passover meal with their staffs in hand and sandals upon their feet (Exodus 12:11). These preparations signified readiness for the journey ahead (cf. Deuteronomy 29:4; Joshua 9:5,13). The books of Deuteronomy and Ruth explain rites in which removing one’s sandal(s) — or having them removed by another — nullified previously binding legal and social ties (Deuteronomy 25:9-10; Ruth 4:7-8; cf. Amos 2:6, 8:6), creating the conditions for new claims, new relationships, and new responsibility.